08 Nov 2018 --- With half of all food and beverage launches in 2018 year to date having a better-for-you claim, the surge in product innovation catering to consumer demands for a healthier lifestyle is clear-cut. But what are some of the standout strategies for creating products with a much sought after health halo? Yesterday’s webinar presented by Innova Market Insights cast a light on the role of protein, fiber and natural ingredients in providing formulators with key strategies to convey overall wellness in food and beverage development. Consumer research has indicated that consumers are seeking to boost their diets and overall health with more fruits and vegetables, notes Browner. “Fruit and vegetables are what consumers considered as a healthy intake and now we see more applications in new product development. It’s the green ingredients that are taking to the stage. So brands are greening up their portfolio to attract these health-conscious consumers who say they have increased their consumption of fruit and vegetables,” she says. Companies are finding success in fruit and vegetable applications and the market dynamic has led to a surge in new product development within potential categories. Innova Market Insights data further shows high growth coming from the herbal and fruit extracts. Delving deeper into fruits application, the top three fastest-growing fruit ingredients over the past three years were watermelon juice, followed by jackfruit and durian, indicating growing market potential for exotic and unique fruits, with a range of possible health connotations. area for the incorporation of proteins. 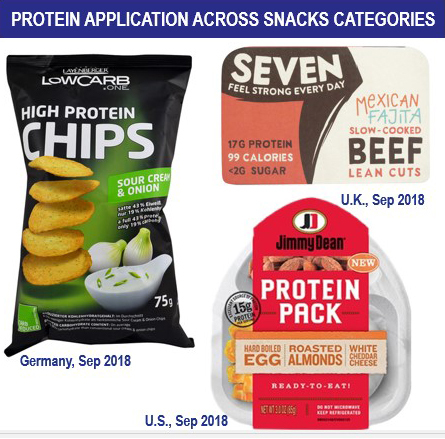 Protein continues to find application across food and beverage categories and is definitely on the top of consumers’ minds. A 2018 Innova Market Insights consumer survey found that nearly 50 percent of UK consumers are influenced by protein content when buying food and beverages, making it an attractive way for formulators to grab consumers’ attention. Dairy ingredients remain a well known and often used source of protein, but alternative proteins, including the growing range of plant-based options, are continuing to gain traction. “North America is the leading region applying plant protein over the past five years while Asian and Eastern Europe have rapidly adopted plant proteins over the past year when comparing 2017 with 2016 launches,” Browner explains. “The fastest growing plant protein ingredient is pumpkin seed protein with a CAGR of 37 percent over the past three years, followed by rice protein with 27 percent, sunflower protein with 25 percent, pea protein with 23 percent and finally potato protein 14 percent,” Browner says. Snacking is proving to be a particularly popular area for the incorporation of proteins. A 2018 Innova Market Insights US survey on what factors consumers prioritize when purchasing snacks found that 40 percent of consumers seek out a protein source, followed by an energy boost and indulgence accounting for 30 percent of respondents. “We also find on the database that there is a 35 percent average annual growth of new snack launches tracked with this protein claim. So again, the industry is responding to the consumer’s demand for protein in snacks,” she notes. Sports nutrition has always had a strong focus on protein content. This has grown higher in recent years as this interest has moved into the mainstream. 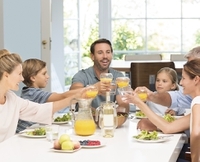 It is apparent across the food and drinks market as a whole, with 6.5 percent of all food and drinks launches recorded by Innova Market Insights in 2017 using high-in, source-of or added protein positionings, rising to nearly 12 percent in the US. Use for sports nutrition launches rises to over 40 percent. Fiber has jumped back into the spotlight recently, showing potential for inclusion in an array of food and beverages. Fiber is no longer only the domain of grains and cereals but is appearing as a functional addition across many categories, as well as a replacement for sugar. “When we ask consumers in the US and the UK about their fiber consumption, we found that 44 percent of US respondents, and 33 percent of UK respondents, are increasing their consumption of fiber,” Browner notes. A crucial element of fiber’s rejuvenated image for suppliers is the US Food and Drug Administration (FDA) ruling from June which will allow eight specific fibers to be classified as “dietary fibers” on the upcoming Nutrition Facts Label. Newly discovered health benefits are also strongly driving fiber applications and consumer interest. Digestive health continues to be the leading health claim. However, Browner explains that weight management also scored highly among consumers, with just under 25 percent of US respondents citing this as a possible benefit, closely followed by heart health, energy/alertness, immune health and brain health. Indeed, research has shown how fiber’s health halo is expanding beyond digestive health. The consumption of dietary fiber has been found to reduce brain inflammation during aging by University of Illinois researchers, as well as the combination of soluble fiber and probiotics being found to improve iron uptake in female athletes, as exemplified in the Regular Girl brand. Expanding research is an NPD driver on the industry side, notes Browner. Fiber also has strong potential within the sports nutrition market. “Fiber is playing a bigger role in this [sports nutrition] area. Looking at fiber claims as a percentage of total sports nutrition launches we see that 16 percent of sports nutrition launches in 2018, year-to-date, have a fiber claim. We also see a plus 55 percent average annual growth between 2013 and 2017,” says Browner. Consumers are increasingly mindful of their dietary patterns as awareness around nutrition’s effect on overall health and wellness continues to grow. This growing consumer scrutiny and interest will provide food and beverage companies with both challenges and exciting opportunities to provide products that tick all boxes.